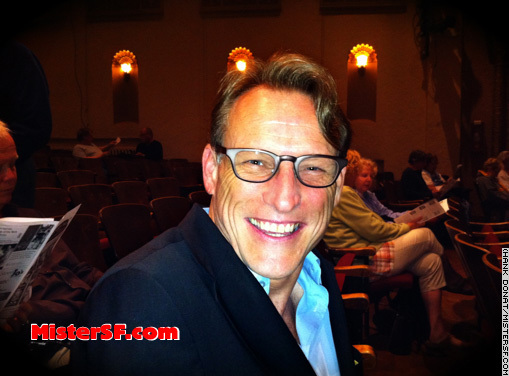 Comedy lover Mister SF was a long-serving stand-up and emcee at SF’s legendary Josie’s Cabaret in the 1990s. When I saw an invitation from Juliana Gallin, I knew I was in for something wonderful. 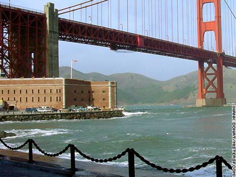 Many years ago, we told you about Gallin’s then brand-new Ask a Scientist lecture series, which has since become a San Francisco institution. Now, Juliana has co-produced a hilarious series of moderated talks with giants of comedy. Called “Comedy Talks,” the series is hosted and co-produced by SF-based comedy magician Robert Strong. 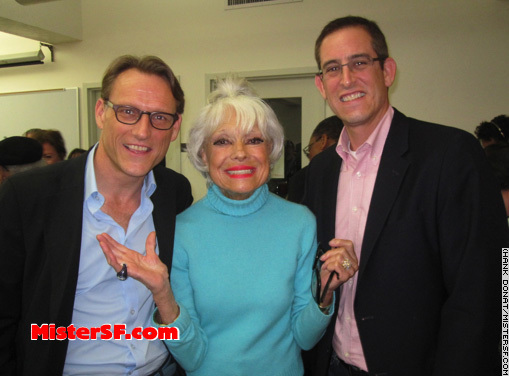 Carol Channing appeared Sunday at the 2010 Comedy Talks symposium in the heart of the City, USF Presentation Theater, 2350 Turk Blvd. 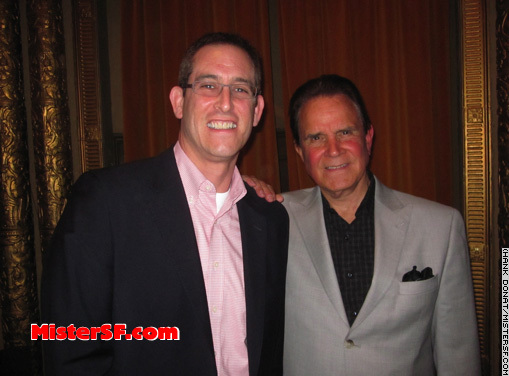 It was a panel with Rich Little, Carol, and comedian Steve Rossi. Rossi and his comedy partner Marty Allen were on the Ed Sullivan Show with the Beatles three out of the four times the Beatles did the Ed Sullivan show! Rich Little, a true “household name,” is the renowned Canadian-born impersonator whose American television career began 46 years ago. Carol Channing is Carol Channing. San Franciscans know Carol as a local gal in addition to being the Queen of Broadway. Her story about marrying childhood sweetheart Harry Kullijian in 2003 after 70 years apart is a widely-known true legend. 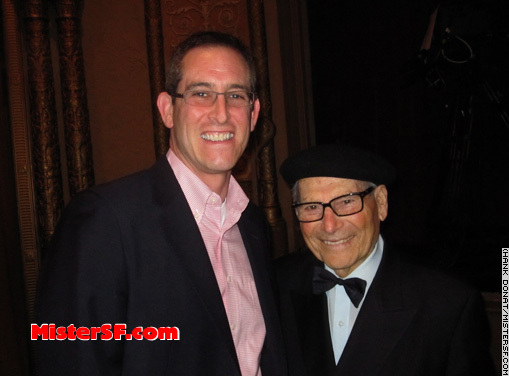 The Real Husbands of San Francisco: Jeff Halpern with Harry Kullijian. Carol always gets to the point she’s making, as I saw her do on The View a few days ago when it seemed the nervous cohosts were so surprised Carol could finish a sentence that they rushed to chuckles and leg pats before Carol corrected, “but wait there’s more.” Carol and Harry have been working with Congresswoman Jackie Spiere (D-12) to bring back the arts in schools, something Carol promoted vigorously at USF and on the TV talk show. 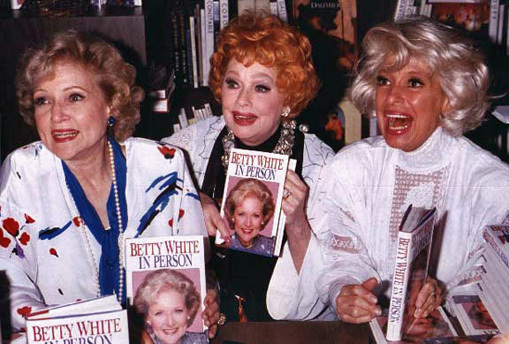 Betty White, Lucille Ball, Carol Channing, circa 1987. When it seemed as though moderator Strong and Rich Little might go down a predictable road by talking about Carol Channing drag queens, Carol reclaimed the moment to talk about what it felt like being impersonated by Lucille Ball for a Lucy episode. Laughter came from our section not only because Carol said she was, “excited about being done by a beautiful woman for the first time,” but because we had just seen the Lucy episode that includes Lucy doing Carol’s voice and it’s very funny. Lucy, who would have been 99 years old last Friday, was referred to repeatedly during the discussion as an exemplar of physical comedy. Little seems perhaps born to play Ronald Regan in a serious role. No kidding. He was a friend of Reagan’s and has obviously absorbed not only the dead President’s voice and mannerisms, but also an insight. Little is a Republican. His Barrack Obama impression is funny, even if this audience wasn’t ready. Carol remembered another legendary San Francisco comedienne, Gracie Allen, in a story about Gracie herself choosing Carol to work with Gracie’s husband and comedy partner George Burns while Gracie was ill. Channing says Burns raised the level of her comedy, telling her to emphasize the word LOOK instead of NATURAL in a bit where the punch line, “That’s how I get that natural look,” came after an extended setup by Carol about Carol applying her makeup. This is what the best comedy symposia are all about. Some attendees told us the August 1 session with George Segal, Paul Mazursky, and our friend Ronnie Schell was even funnier. 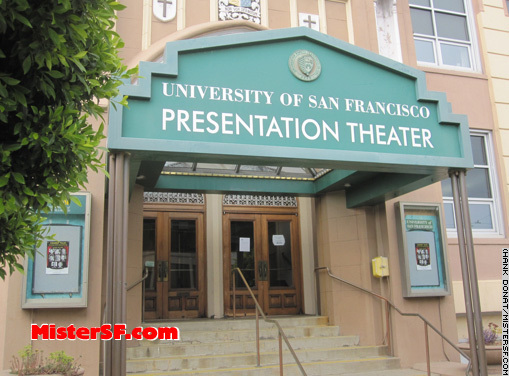 USF Presentation Theater, 2350 Turk Blvd. Gallin and Strong have solid support from the City’s community of comedians and producers, many of whom were in attendance. Comedy Talks producers are filming the events for a possible television program. Robert Morse, Shelley Berman, and Will Durst appear on Sunday, August 15. Free parking is available in USF campus lots. For further information visit comedytalks.com. Carol, I love your generous spirit, incredible passion and wonderful sense of humor!!! CAROL CHANNING … YOU ROCK!! Thanks for heralding the benefits of the ARTS and helping bring the ARTS back into the public school curriculum!